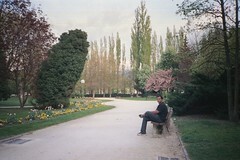 In April this year, I had the opportunity to travel to France. Travelling to France is something I've dreamed about ever since I first studied French in 1988. 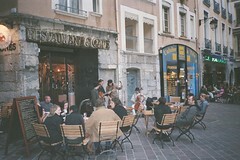 My port of stay was Grenoble, which isn't exactly the typical French city, but it will do for now. When I left Bangalore, the weather report in France pointed towards Spring . I packed 10 t-shirts and a couple of pairs of jeans, cotton socks and tennis shoes. Yup, this was going to be nice. Descended into Frankfurt for a change of flights. Fog all around. Oh well. That's Frankfurt I guess. Frankfurt was a good stopover. Got a chance to practice some German and had zwei Würtz mit Brotchen. It was sehr gut and bloody expensive too. Got myself Harry Potter und die Kammer des Schreckens from a bookstore for 15€. Someone please remind me to take pictures next time! After the 5 hour wait at Frankfurt, left for Lyon. No window seat, but I could see out the window. Decided to pass some time reading Le Monde. Turned to the weather page. samedi et dimanche: neige. WTF? Looked out the window as we descended... ok, I'm not prepared for this, but whoa, cool! Snow! Everywhere. This was great and bad at the same time. Luckily my cab was waiting at the airport and after a brisk walk across the airport driveway and to the parking lot, I got into the cab. Decided to sit in the front for a good view and to have a chat with the cabby - Bernhard. He explained quite a bit about the area, and I explained a bit about where I came from and the lack of snow back there. Didn't have a chance to freshen up, had to go straight to the office as it was Monday afternoon already. Dinner that night was escargot. Put my cholesterol problems behind me for a bit and promised to be prudent for a long time to follow. It was good. 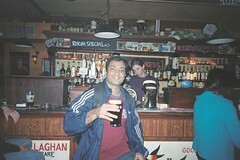 Later that night we ended up at O'Callaghan's where the only beer they serve is Guinness. Yup, that's me in the pic. The next couple of days were spent at work with trips to the centre of town for dinner. Went back into town on the weekend, this time for some shopping and real sight seeing. I'd wanted to check out the Bastille all week, but it was too late on Friday evening. Shops were still open though, so I just walked around a bit. 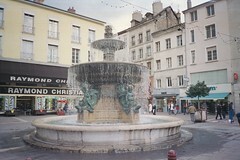 Victor Hugo is the town centre (at least I think so). One can start out from there and go in any direction to find places to eat, bookstores, department stores, and pretty much anything else. All trams stop there, so it's quite convenient. Asterix et les Goths — yeah, I had to have this one. French and German in one literary work. How could I miss it? Harry Potter et la chambre des secrets - I'm building a collection of this one book in multiple languages... or so I say. Saw some other really nice books, but they cost €50. Damn, I can't afford that much. I only get a $50 daily allowance! That's like €35 to cover all my expenses in a day. Ok, I shall not speak anymore about how expensive the place is. While walking around I'd noticed these Organic Shops . Went into one of them. It was like a grocery store with all organically prepared fruits, vegetables and juices. Got myself an orange juice and a pomelo (un pamplemousse en Français). I'm not sure what the difference is, but it was tasty. Daylight lasts really long, so even at 8pm it was still bright enough to see everything. I strolled into a park and walked around. Great for bird watching, and many people come there with their dogs too. They have parks where pets are permitted and others where they aren't. The park had a few memorials in it donated by individuals or groups. One of them was for 6 children who had died while on an excursion. Another was for the millions of victims of the Armenian genocide. The next day I managed to get up to the Bastille, and could see all of Grenoble from there... and that's what I shall leave you with tonight. Good collection of Grenoble posts here. I like (and may copy idea) this 'walking' journal of yours. Cheers. I just took three shots in quick succession, rotating my body from the waist. Stiched them together using the gimp. Basically increase the transparency of the images to align them. A little skewing was necessary to account for the angle.